White mold is a common problem in many residential homes. 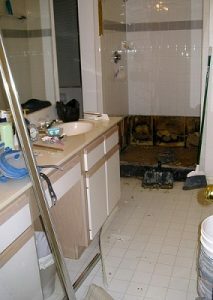 However, it does not get the exact amount of attention as black mold. This is because of a notion about the toxic black mold that has led to inflated fears in many homes. Although the color of mold can be used to rule out particular types of mold species, it is not reliable for positive results when it comes to identifying precise mold species. For instance, Stachybotrys are a type of mold species that is always black. However, Penicillium and Cladosporium are found in a variety of colors. The growth of white mold actually offers an additional challenge when it comes to mold inspection. This is because most people confuse it with efflorescence on many occasions. When water moves through a masonry structure, it simply brings up unbounded salts. As the water evaporates, it leaves behind a white, fluffy substance. Although this growth is relatively harmless, it may appear exactly like a white mold growth. This is the first important thing to note when dealing with white mold at home as it helps you make effective decisions before taking any action. There are conditions that are conducive for mold growth at home. Therefore, you can be sure to find white mold in any place that offers a conducive environment. The most common areas for white mold growth actually include crawlspace framing and attic sheath. A qualified expert for attic mold removal in Toronto is in a position to determine whether a growth structure is the result of efflorescence or white mold. Secondly, efflorescence is readily going to dissolve on the application of water on a particular surface. White mold remains on the surface even after the application of water. In addition, the material of the substrate can help you to determine whether you are dealing with efflorescence or white mold. You will mostly find efflorescence on brick, concrete and other masonry structures. However, you can rule out efflorescence when you find a white mold-like substance on wood surfaces and sheetrock. Another way for distinguishing the two (though less effective) is smell. While white mold gives out a particular smell, efflorescence is actually odorless. Is white mold a serious threat in residential homes? Well, a good number of molds cause allergic reactions in very sensitive individuals. This implies that no area at home with a significant mold growth is safe. Effective mold inspection, collection and removal techniques should be put in place to ensure that the threat is eliminated as soon as possible regardless of mold color. Direct sampling is a method that can be used by mold removal contractors to determine the presence of white mold. The methods under direct sampling actually include bulk samples, tape lift and swabbing. Once a technician has collected enough samples, he takes them to the laboratory for further analysis. He will then determine if it is a mold growth and the species type. The approach you take when dealing with mold should be the same regardless of mold type. Mold remediation should be done effectively with the aim of completely eliminating the presence of mold in residential homes. This is because many types of molds (including non-toxic molds) cause allergic reactions in very sensitive individuals. This simply puts that mold color is inconsequential and that all cases of mold should be handled with the same remediation approaches. There is no need to confuse things. Taking a standard approach to handle all types of mold makes things simpler for you. November 30, 2016 in Mold Inspection.